The critical response to the original Cars (2006) always struck me as a bit misguided. While not among Pixar’s finest forays, the concept is fairly well-executed, and this is coming from a guy who never found much enjoyment in Hot Wheels as a child. Taking an inanimate object and giving it life is hardly new, but Pixar added a level of ingenuity and depth to their characterizations that expanded beyond something that could’ve been appreciated exclusively to children. But with Cars 2, there’s a definite step back from what I considered to be a fairly agreeable original film. The step back stems from a change in character obligation. 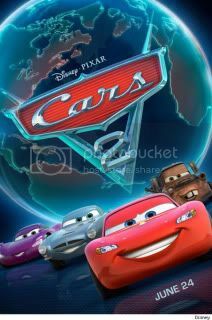 The original Cars featured Lightening McQueen (Owen Wilson) as the primary protagonist, with Mater (Larry the Cable Guy) acting as support. The two shift gears (ha!) for this sequel and the results are questionable. Mater’s role in the original functioned as the sort of dim-witted friend whose intellectual short-comings were the basis of a few sturdy, if unremarkable jokes. With Cars 2, there’s almost a dependence to come up with jokes that rib on Mater’s idiocy. At times they can be humorous, but the redundancy of it becomes fairly annoying as the film progresses. Perhaps even more distressing is that McQueen’s side-story is infinitely more interesting than the quasi-spy narrative that drives (ha! x2) Mater’s story. McQueen’s banter with his European rival Francesco Bernoulli (John Turturro) makes for some of Pixar’s most funny exchanges, if only highlighted by Mater’s consistently over-the-top drawl and idioms. What Cars 2 does expand on is its sense of worldliness. We’re transported to exquisitely designed sites throughout Japan, England, France, and Italy; all modified to accommodate our car pals. The visuals are lush, crafted with such diligence and detail that one could simply sit back and embrace the elegance in technique. The few racing sequences throughout the film highlight Pixar’s ability to match formal excellence with visual cunning, often while balancing a the banal central narrative at the same time. 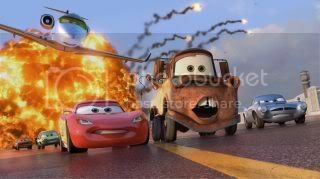 I liked Cars 2 as the sort of excursion that one associates with a summer film. But the curse of expectations stems from Pixar’s previous track record of churning out masterpiece-level work on a semi-consistent basis. Up, WALL-E, Ratatouille, and even Toy Story 3 all provided audiences, both the casual and the critical, with rich characters and narrative arches. The original Cars fell a bit short from fully achieving that notion; Cars 2 is even shorter of it.